If totally fudgy, chocolate goodness is what you crave in a protein bar, then this recipe Is for you. 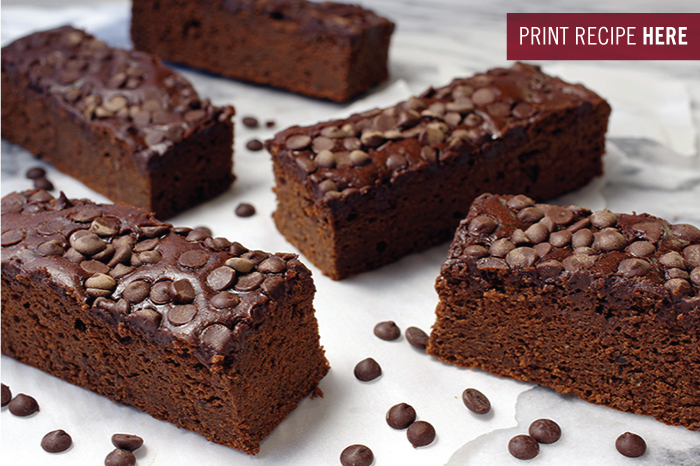 If you have not heard of black bean brownies before now, I understand the wariness – beans + chocolate = brownie sounds like new math gone terribly wrong. But then you take a bite and realize that everything about these bars is 100% right. 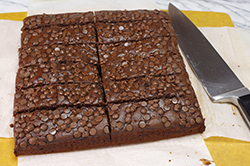 Some black bean brownie recipes try to take out all of the fat and the sweetener, which, while noble, leads to a pan of cocoa-flavored bean squares. By contrast, my version keeps a reasonable amount of fats and sweeteners, balancing it out with maximal protein (eggs + protein powder + beans), which leads to pan full of deliciousness. The choice is yours, my friend. 1. 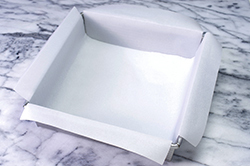 Line a 9-inch square baking pan with foil or parchment paper and spray with nonstick cooking spray. 3. 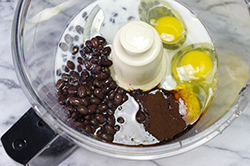 Place the beans, agave nectar, eggs, milk, oil, espresso powder, and vanilla in a food processor. 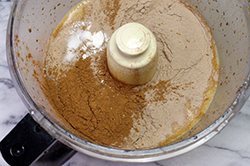 Process, using on/off pulses, until the mixture in blended and completely smooth, stopping to scrape the sides and bottom of the bowl several times with a rubber spatula. 4. 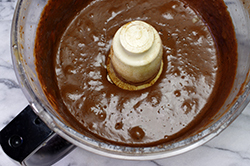 Add the protein powder, cocoa powder, baking powder, and salt to the bowl; process using on/off pulses until all of the protein powder is incorporated, stopping to scrape the sides and bottom of the bowl once or twice with a rubber spatula. 5. 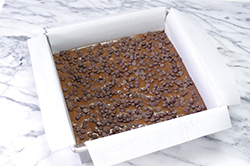 Spread the batter evenly in the prepared pan; sprinkle with the chocolate chips. 6. Bake in the preheated oven for 25 to 30 minutes or until the top appears somewhat dry and the edges begin to pull away from the sides of the pan. Transfer to a wire rack and cool completely. 7. Using the liner, lift the mixture from the pan and transfer to a cutting board. Cut into 12 bars. Store in the refrigerator or freezer. 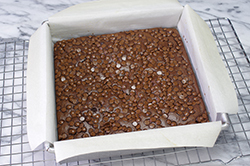 -	- These brownies will look different from conventional brownies in two ways when they are done: first, the top will look much drier, and second, the center will feel gooier when lightly touched. Once cool, though, they are fudgy, not dry; then center will set up once the bars are completely cooled (and even more so when refrigerated). -	Pinto beans or soft white beans (e.g., cannellini or Great Northern beans) can be used with equal success in place of the black beans. 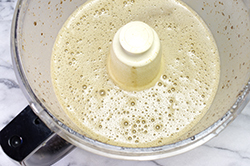 -	For a lower sugar brownie, omit the agave nectar and add 1-1/2 teaspoons liquid stevia. Increase the total amount of milk to 2/3 cup. 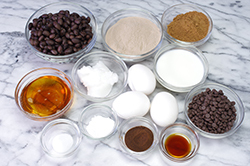 -	1 tablespoon coffee powder (regular or decaffeinated) may be used in place of the espresso powder. Tightly wrap the bars individually in plastic wrap. MOCHA ALMOND PROTEIN BROWNIES – Increase the espresso powder to 1 tablespoon and replace the vanilla extract with an equal amount of almond extract. CHOCOLATE-CHERRY PROTEIN BROWNIES – Replace the vanilla extract with an equal amount of almond extract and add 1/2 cup chopped dried cherries to the batter. VEGAN BLACK BEAN BROWNIES – Use vegan protein powder in place of the whey powder and plain nondairy milk in place of the milk. Additionally, replace the eggs with flaxseed or chia “eggs”; combine 3 tablespoons flaxseed meal or chia seeds with 1/2 cup plus 1 tablespoon warm water, then let stand 5 minutes to thicken. Reprinted with permission from Power Hungry, The Ultimate Energy Bar Cookbook by Camilla V. Saulsbury. Copyright 2013. Published by Lake Isle Press, New York, NY. All rights reserved.